In a room with a couple hundred other people, racing the clock and all those other geniuses who know that frybread is a “Naan-like Native American food,” epee is a “sword’s name with two accents,” and that shandy is a “beer and lemonade drink.” They also know who Danny Ainge, Joni Ernst and Gotye are, plus tons of other random stuff. All those people who enjoy option #2 gathered this afternoon at the Saugatuck Congregational Church. 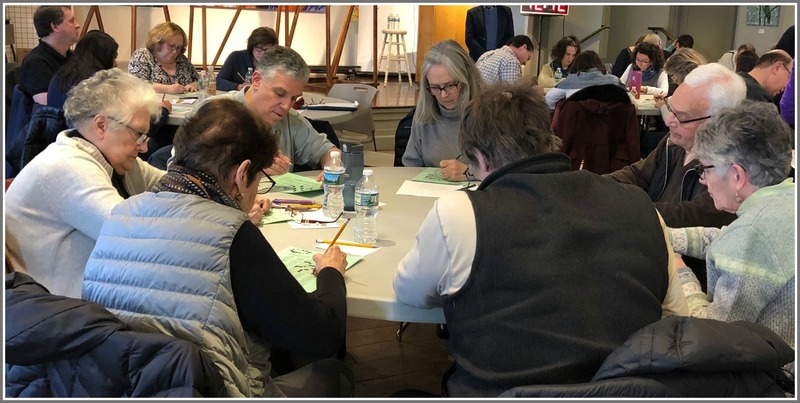 They competed — good-naturedly, but fiercely — in the Westport Library’s 20th annual Crossword Puzzle Contest. Solving crossword puzzles takes concentration. 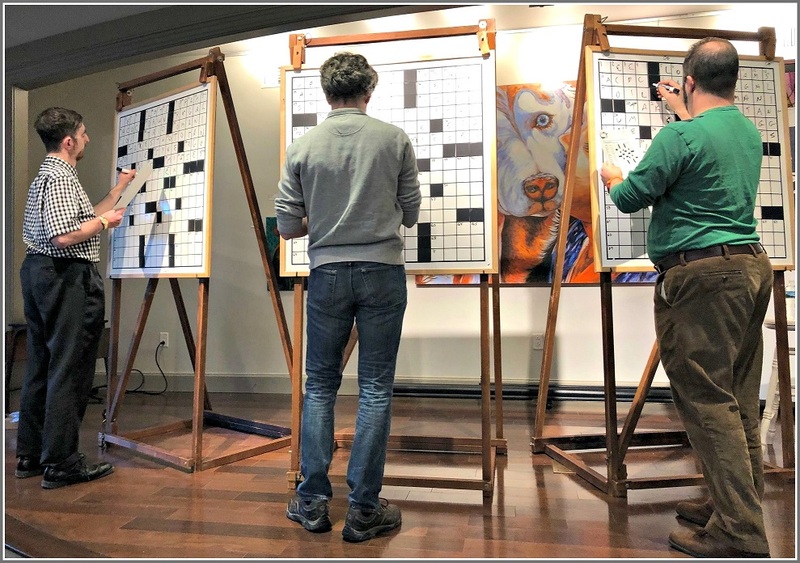 For the 20th year, it was puzzle-master-minded — and presided over joyfully and cruciverbally — by Times crossword editor (and NPR star) Will Shortz. 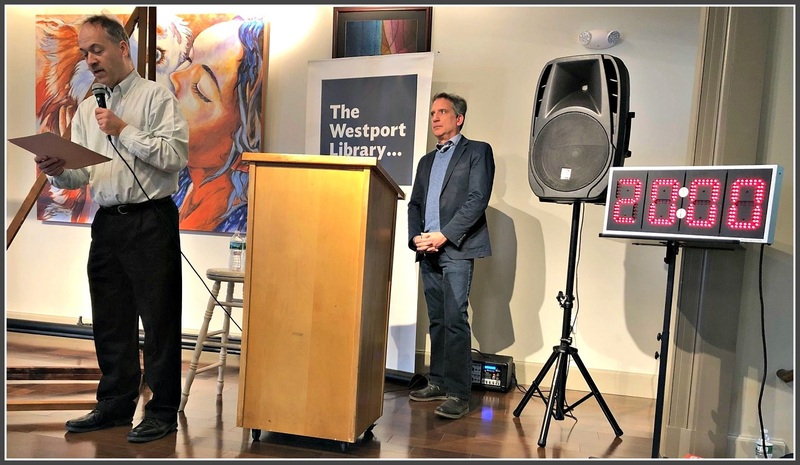 New York Times puzzle editor Will Shortz and Westport Library director Bill Harmer entertain the crowd. The countdown clock is at right. Contestants came from as far as North Carolina and Illinois. Ages skewed older, though there were enough younger faces to make Gotye a legit question. 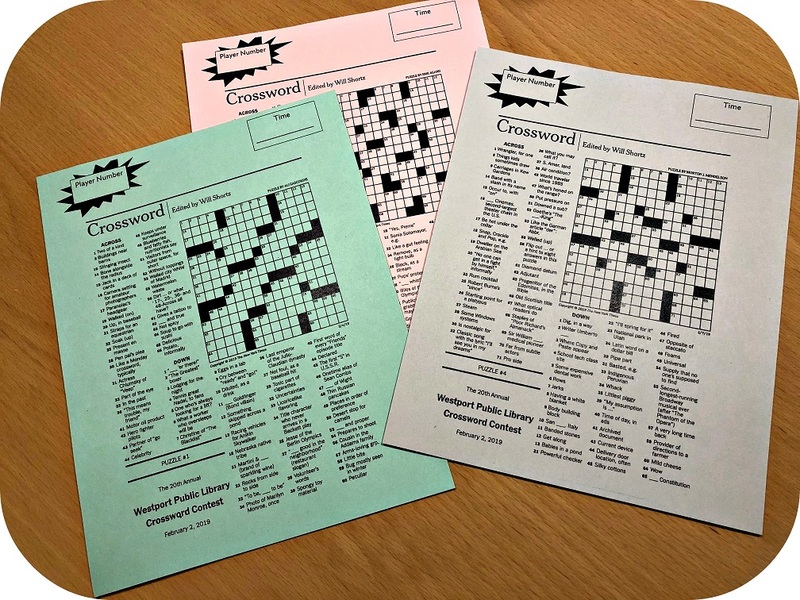 After 3 rounds of increasing-in-difficulty Monday, Tuesday and Wednesday puzzles, the top 3 contestants (based on speed and accuracy) faced off for the title. They stood on stage, solving a tough Thursday crossword as the crowd watched. The finalists (from left): Glen Ryan, Jesse Lansner and Ken Stern. Glen Ryan finished in 6:50. However, he got one answer wrong. Jesse Lansner was 2nd, in 7:30. But he got one wrong too. So Ken Stern — slow, steady and perfect, in 11:37 — was declared the winner. I did not make the finals. But I was one of a few dozen to complete all 3 Monday through Wednesday puzzles perfectly. Though I still have no idea who Gotye is.